This is part 3 of an ongoing series. In Part 1 we looked at feed dogs, needle plates and adjustable presser foot pressure while Part 2 covered hook types and motors. Today we'll be looking at the somewhat confusing topic of presser foot shank type. From left to right: Low shank foot, high shank foot, Singer slant shank foot, Kenmore super high shank foot, Pfaff super high shank, and Bernina Old-Style foot. Today I'll cover 5 of the most common shank types plus a bonus. By far the most common domestic shank type, the low shank foot has basically won out in the "Battle of the Shanks". With the exception of Bernina machines today, nearly all modern domestic sewing machines use this shank type. The shortest of all the shanks, the distance between the thumb screw and the foot bed in low shank feet is about 1/2 an inch. Historically, the Singer Manufacturing Company led the pack in vintage sewing machine production. The vast majority of Singers used a low shank foot, however, if I had to hazard a guess, I'd say it was the Singer Model 15--cloned many times over--which ultimately led to the wide spread use of the low shank system. After WWII, Japan was gifted the plans to Singer's Class 15 design in an effort to jumpstart their economy. Japanese manufacturers would copy and improve upon this design and were later able to undercut Western competition. The rest is history. One by one, Western sewing manufacturers closed shop and years later, the Asian sewing machine industry dominates global production. But before all of that, back in the 50s, Singer developed the Slant Shank System in an effort to differentiate themselves from the pack. First introduced with the Singer 301a, slant shank feet are a proprietary Singer system used only by their Slant-O-Matics. This would include the Singer 401, 500a Rocketeer and later Touch and Sew models. This new and 'improved' system was purported to provide better visibility of the needle. The Singer 301a was originally marketed to educators and schools and the slant shank system was meant to lock schools into buying only Singer. It was Singer's belief that the education system would produce a whole new generation of sewers raised on slant shanks who would then buy into this proprietary system. Pretty ingenious if you think about it. The length of the shank is just over an inch and the distance from the thumbscrew to the footbed is about an inch. While not nearly as common as the low shank foot, there have been so many slant shank Singers sold that manufacturers still produce slant shank reproduction feet. While your modern options are somewhat limited, there are still a decent variety of feet available. Hot on the heels of Singer, Sears Roebuck & Co.'s line of Kenmore sewing machines were not to be outdone. Produced in Maruzen, Japan, 158.x series of Kenmores were more feature rich than their Singer counterparts. While the bulk of their machines were low shank, a number of their higher end offerings like the Kenmore 158.1803s and 158.1914s (to name a few) started using a new proprietary shank system, the Kenmore Super High Shank. Not to be confused with the similar looking Singer slant shank, the two types are not interchangeable. The distance between the thumbscrew and the foot bed is about 1 1/4 inch. No longer in production, these are far less common than slant shank feet. Super high shank feet are somewhat difficult to find especially as singletons, so be prepared to purchase a whole bundle of Kenmore attachments if you're hunting for a specific foot. It's worth noting, that many of the super high shank Kenmore models have a left of center straight stitch needle position. High shank feet are the industrial sewing standard. There are a few industrials that use other types of feet, but this is far and away the most common. Some domestic machines, like Necchis, use high shank feet as well. 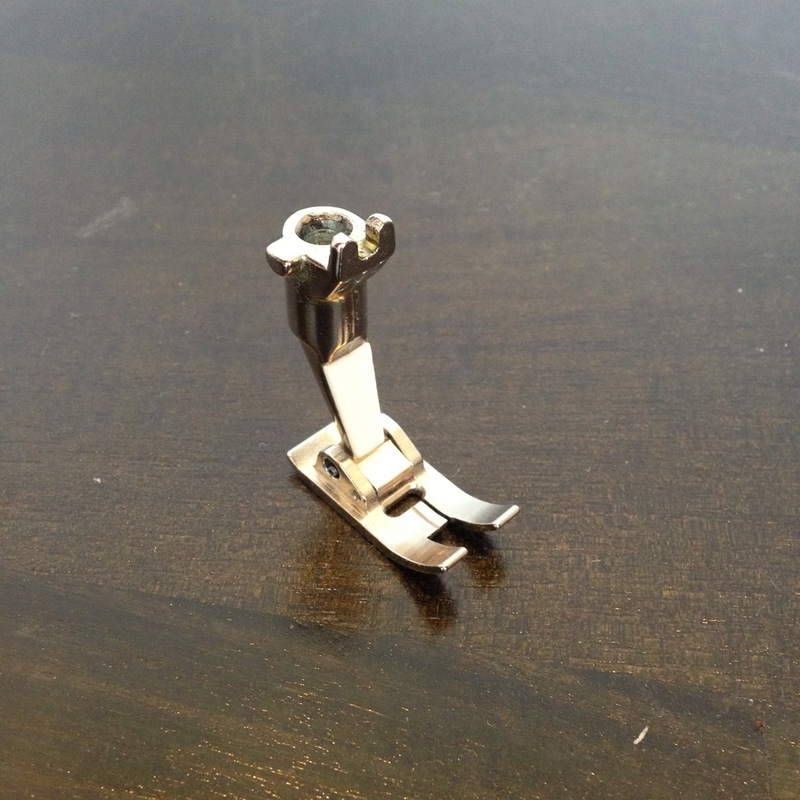 As industrial sewing is so specialized, myriad specialty feet are available. It isn't at all uncommon for garment manufacturers to custom weld their own specialty feet. If you're looking for a presser foot system with tons of specialty options, the high shank system is the way to go. While industrial high shank feet tend to be much more solidly built, you do have to be careful as sometimes the fit isn't always universal. On the flip side they are relatively inexpensive compared to low shank feet and especially Bernina feet. You can often buy a whole set of these for the cost of one Bernina foot! These measure approximately 1 inch from thumbscrew to foot bed. These are specific to Pfaff industrials and not common at all. I've included it here simply to illustrate that there are additional shank systems out there. I'm not really sure why these were made because the Pfaff industrials can also use regular high shank feet. These are virtually impossible to find nowadays and while reproductions are being made, their fit is suspect. Even if you can find genuine parts, these are prohibitively expensive. 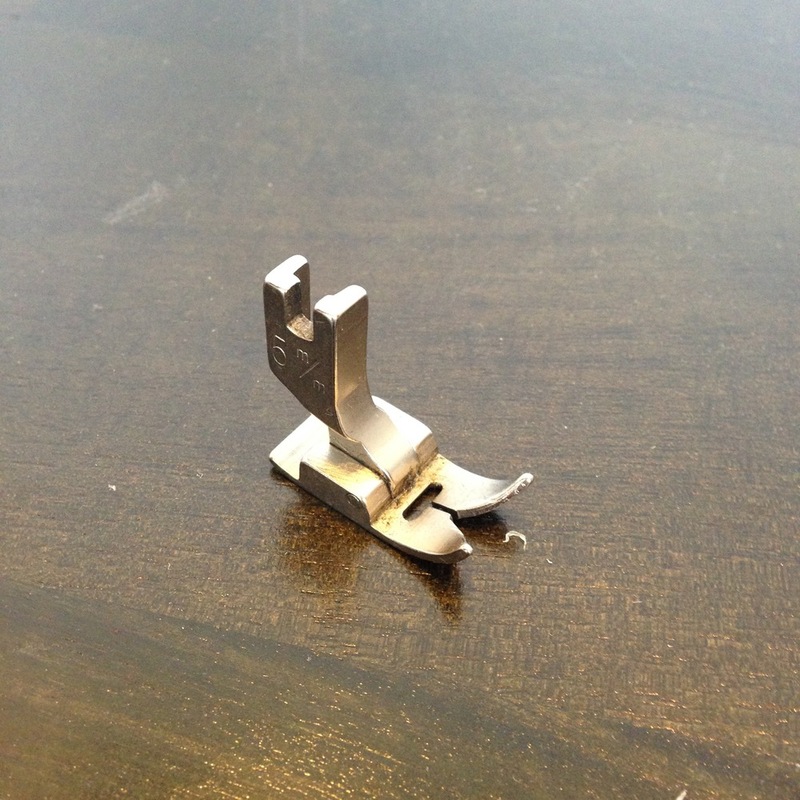 Bernina presser feet sit in a class of their own. Foregoing the classic thumbscrew attachment, these feet are attached via a proprietary locking lever. Genuine Bernina feet are some of the highest quality (and most expensive) feet available today. Even the reproductions tend to be very nice. Below is an excerpt from my Bernina 830 Record review. Ancient Style Feet - are attached via a screw. Vintage Style Feet - found on the x30 series up until the 930. These often have a 3 digit number that is engraved into the top of the foot and are designed for a maximum zigzag width of 4mm. These will not fit machines past the 930 due to their capped max width. Old Style Feet - these have the white sticker with two black numbers and are designed to accommodate a max zigzag of 5.5mm. These WILL fit the older x30 series as well as the modern 1008. New Style Feet - these have the white sticker and red numbers. These are not backward compatible at all. Very often, you'll find sellers that do not differentiate between what I call Vintage Style Feet and the Old Style Feet so just be aware of this. The Vintage Style Feet are NOT forward compatible, but the Old Style Feet ARE backward compatible. Talk about confusing! Here is a comparison of each of the presser foot types I've discussed thus far. From left to right: Pfaff super high shank foot, Kenmore super high shank foot, Bernina foot, high shank foot, slant shank foot, and low shank foot. When it comes to fit, it should be abundantly clear that shank type matters! So what happens if you can't find a specific specialty foot for your shank system? Thankfully, you're not totally out of options. A number of adaptors are available to allow high shank and Kenmore super high shank machines to use low shank feet. Bernina even has two different adaptors to low shank feet. Unfortunately, you can't go the other way around and use an adaptor to use high shank feet on a low shank machine. It's physically not possible... unless you change your presser bar height. But let's save that for a future article.